In the work bowl of a food processor, combine flour, 1/2 cup granulated sugar, pecans, and 1/2 teaspoon salt, pulsing to blend. Add butter to flour mixture, pulsing until mixture is crumbly, approximately 30 seconds. With the food processor running, gradually add 2/3 cup cold water, in a slow steady stream, through lid opening until mixture forms a ball. Flatten dough into 2 disks, wrap in plastic wrap and refrigerate for 1 hour. On a lightly floured surface, roll 1 pastry disk to a 1/8-inch thickness. Fit dough into 12 (2-1/2-inch) mini pie plates. Trim dough around the edges. Freeze until dough is firm, approximately 10 minutes. Pierce the bottoms and sides of dough with a fork. Bake until golden, 6 to 8 minutes. In a small bowl, combine cornstarch and remaining 2 tablespoons cold water, stirring until mixture is blended. In a large saucepan, combine cherries, cornstarch mixture, remaining 1/4 cup granulated sugar, and remaining 1/2 teaspoon salt. Cook over medium heat until cherries are soft and mixture is thick. Add lemon juice and vanilla, stirring to combine. On a lightly floured surface, roll remaining pastry disk to a 1/8-inch thickness. Cut dough into very thin (1/8 to 1/4-inch-wide) strips. Arrange enough dough strips vertically side by side to achieve at least a 2-1/2-inch width. Pull back halfway every other vertical strip, and place a strip horizontally across remaining vertical strips. Return to their original positions the vertical strips that were pulled back, and pull back the other vertical strips. Place another strip horizontally across remaining vertical strips as close as possible to first horizontal strip. Continue to tightly weave 1 horizontal strip at a time into the vertical strips, working out form the center to make at least a 2-1/2-x-2-1/2-inch lattice top for each mini pie. 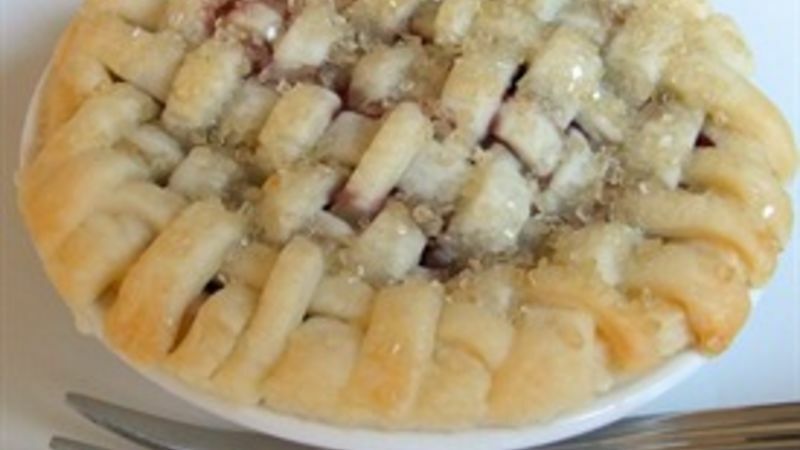 Using a spatula, carefully transfer lattice tops to prepared pie plates. Using a knife, trim the edges. Gently press edge of lattice tops to seal. Brush top and edges of dough with cream. Sprinkle the top of each pie with 1 teaspoon Turbinado sugar. Bake until crusts are golden, 18 to 24 minutes. Serve warm with a scoop of vanilla ice cream, if desired.